We offer Oil/Water Separator (OWS) systems for a variety of applications, including: air compressor condensate, grinding & machine coolants, mop water, rainwater, rinse water, wash water, and others. The systems we supply feature an excellent discharge oil carryover down to 10 ppm or less, and are sized for flow rates from 1/2 gallon per minute up to 5000 gallons per minute. Our systems include a number of options such as air-operated pumps & controls, freeze protection, high temperature designs and many others as required by specific customer applications. See our most popular OWS systems manufactured by Pan America Environmental that will process many different types of wastewater from 5 to 50 GPM flow. ConDePhase Plus OWS System uses coalescing, gravity and carbon absorption separation methods while processing the compressor condensate. Easy installation with no moving parts. Tough, impact-resistant, high density polypropylene construction. Water effluents containing 15 ppm or less oil for most compressor oils and 50 ppm or less for polyglycol oil. 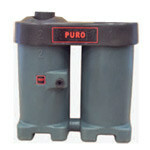 The PURO OWS uses various filtration stages to achieve the lowest possible oil residue. The first stage is an adsorption filter that utilizes a material that is treated and designed to adsorb oil, not water. The condensate flows through the filter and the oil is adsorbed. Subsequent separation stages are completed with specially selected activated carbon to polish out the remaining contaminants. Does not incorporate/require a condensate settling tank, thus it’s compact in design. Any type of condensate drain can be applied. Water effluents containing 10 ppm or less oil for most compressor oils. 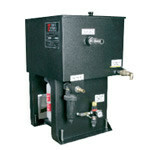 Low flow requirements from 0.5 to 5 GPM. Phasep OWS uses a steel coalescing plate pack, tri-ball float and weir dam for its separating technology.